Haunted by a book found in her dead brother's room, Pari wanders around to find answers for a meaningful life. Esteemed writer Mahmoud suffers from writers block. While trying to work at the family estate, concerns about an unproductive pear tree trigger in him memories of his childhood love for beautiful tomboy "M". A mother of a poor family, has guests coming over, yet doesn't know how to get the dinner party altogether with limited resources. The summary posted above was incomplete. Pari is based on the J.D.Salinger story "Franny and Zooey". Salinger's lawyers went after the director in 1998 blocking it from being screened at a Iranian Film Festival (Film Society at Lincoln Center). The story is the same minus (the non-Islamic approved) drinking, smoking and cursing. 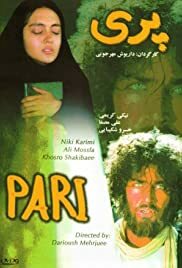 The character of Pari is Franny and like Franny she struggles with the concept of Ego and her desire to be an actress but continue to thrive on what her older brother (Semore or in Mehrjui's film it is Asad) had taught her about Eastern philosophy (in particular Buddhism). It is also his death by self immolation that takes on particular weight for both Franny and Zooey. Asad becomes her savior/ martyr and she attempt to imitate his actions (setting fire to herself) in order to find relief. The metaphor of the "light lovers" (fish that jump towards light and kill themselves on the shore) becomes representative of Pari's spiritual turmoil. The review given also fails to mention the importance of self mortification and the belief in the twelve imam or representative of the martyred Ali in Shiite Islam. The centrality of a FEMALE character in Post-revolutionary Iran is extremely important. No matter what, a female protagonist is this environment takes on a certain amount of social connotation and gives the story a second layer of meaning. Lastly it should be noted that the film passed the censorship requirements and was actually shown in the Islamic Republic (unlike many Iranian masterpieces). Therefore Pari's story is somewhat conservative on the surface but relies on innuendo for some meaning.